The models at John Galliano’s fashion show represented a tribe of adventuring nomads. They wore large coats with fur accents. Some of them wore enormous hats, others had their hair folded into some strange architectural shape. Like Jean Paul Gaultier, John Galliano used different cultural influences in his show as well. Galliano’s nomads were in fact crossing imaginary borders in search of new land. The show was a true spectacle. Silver glitter fell from the sky and even fireworks were used. We really had to focus not to let that distract us from seriously looking at the collection. 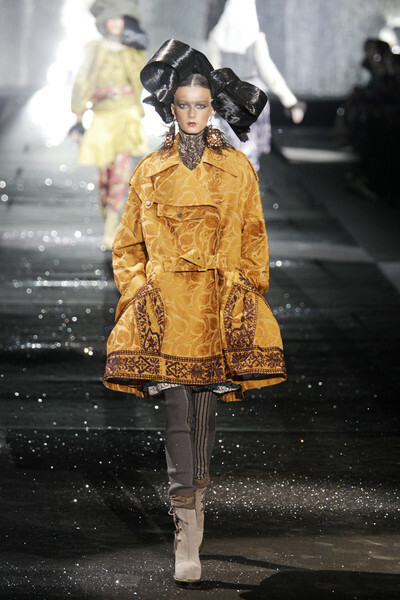 Galliano designed a lot of coats. They first came by in gray, but later on we could also see some green, yellow, gold and printed pink. As always with Galliano many details and accessories were added to the looks, which all deserved some attention. 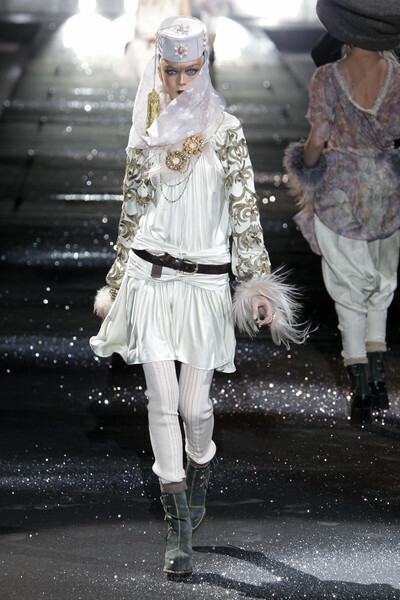 Tight necklaces, waistbelts, fur cuffs, floral printed trousers, feather jewelry, striped leggings and colored shoes. Not to forget the crazy hats, wigs and bronze make-up. 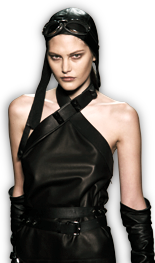 The models looked larger than life in their voluminous designs and oversized hats. Towards the end the fabrics became thinner and more skin was shown. Light-colored and transparent fabrics were used for more feminine designs. The show ended with a few long, gold and silver-embroidered gowns. Although we think transparencies and fur are not the best fabrics to combine in an evening gown, it sure was fun to look at.